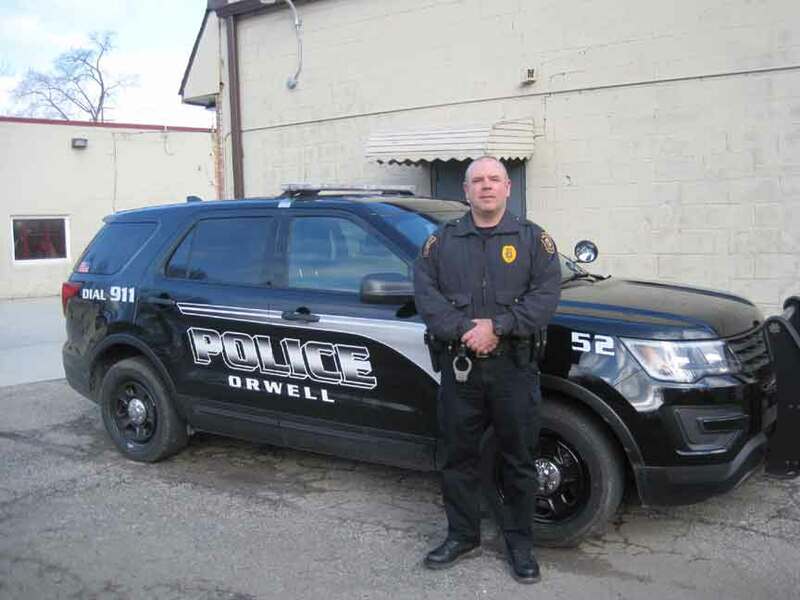 ORWELL – While it’s never an easy task policing a busy village, Orwell Police Department has continued to strive over the years in being visible and proactive for the community of Orwell. (From March 15 edition). According to Police Chief Chad Fernandez he has been working at Orwell Police Department for 17 years now, with eight of those years as police chief. Of these particular officers at the department currently Fernandez said includes five full-time officers including himself, as well as two part-time officers: Bob Johnson who has been there for three years and Tara Ryhal for one year. Three of their full-time officers Fernandez said joined Orwell in 2018: James Lampkin, James Klima and Jarett Pishotti, while Officer David Bonfield joined seven years ago. In regards to changes the department experienced in 2018 Fernandez said includes their fairly recent purchase of two Ford SUV Explorer vehicles in September, as well as new vests for the department last year. As far as reports Fernandez said amounted to 689 total calls in 2018, many of which involved domestic disputes, narcotics and mental health issues. Of the community involvement plans for this year Fernandez said will mainly consist of events that they are invited to (which includes a Law Enforcement Appreciation Day at Lighthouse Baptist Church in Rome on Saturday, March 30) as well as plan to once again hold child restraint checks this year, will be holding a teen driving class at the end of the school year after testing has ended for high students, will be offering fingerprinting and information to local child care facilities, as well as plan to continue their watch program three times a year in order to go over issues/concerns, answer questions and give out information to residents. Pictured: Orwell Police Chief Chad Fernandez next to a Ford SUV Explorer vehicle that was one of two purchased for the department in September of 2018.